This is my first book ever and is the result of doing my best to find out what on earth I could do for myself to control my diabetes because I was virtually blind by the time I was diagnosed. I wrote this book in a very easy to read format so that you could literally read for 30 seconds and get something interesting and useful from it. Following is a description of the CD that accompanies the book. Note that there is a hypnosis session on the CD and several people who have bought the book/CD combo have let me know that their blood sugar levels have dropped after listening to the hypnosis session. This CD is an overview of the book, Control Your Diabetes With Hypnosis which was formerly titled Motivational Hypnosis for People With Diabetes. A few minor details may be different but the CD is still quite valuable for reinforcing the information in the book. This CD also contains an excellent hypnosis session that can be used by any diabetic. 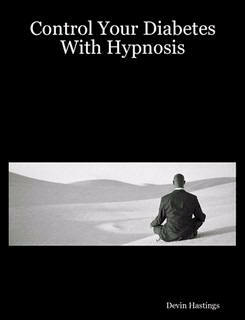 Please note: If you are a hypnotist looking for good hypnosis study material, the hypnosis session on this CD effectively combines Ericksonian hypnosis with direct suggestion and NLP. It is highly instructive. Below are track listings and information topics with playing times. If you decide that you would like a copy, you can own this one-of-a-kind book for 50.00 plus $5.00 for Priority Shipping and Handling. Ordering information is just below. And, should you choose to do so, I thank you in advance for telling your friends and family about my book. "Speak well to yourself because your deep mind is always listening." "Crying is a watershed event." To order one or more copies of Control Your Diabetes With Hypnosis, please click on the "Add To Cart" button below. Thank you! at the annual NGH Convention in Marlboro, Mass.